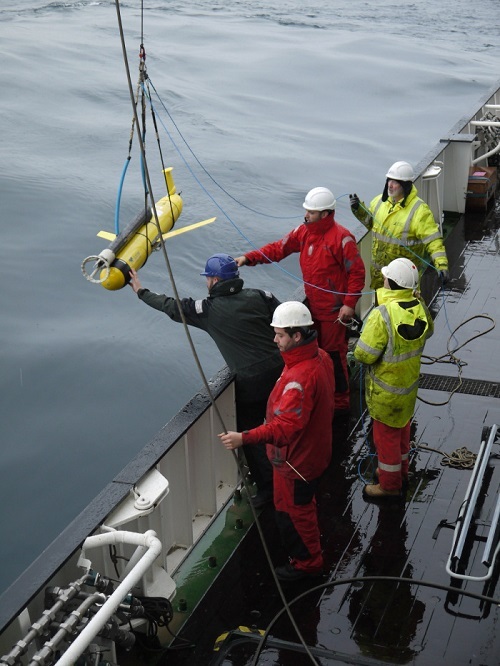 UK Shelf Sea Biogeochemistry Blog: Glider away…. Two new pieces of equipment deployed yesterday. 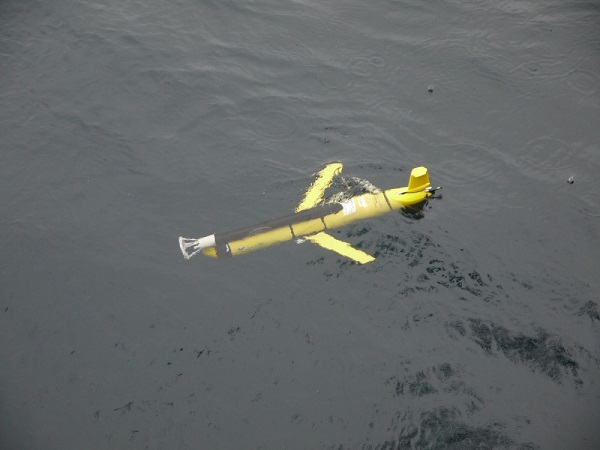 First, the Ocean Microstructure Glider (OMG). A glider does exactly what the name suggests – it glides through the sea. By making itself heavier than the water, and tilting its nose downward, it glides downwards. Then, when it gets to the depth at which it has been instructed to turn round, it makes itself lighter than the water, points the nose up and glides towards the surface. Inside a glider are instruments similar to those on the CTD – measuring water temperature, salt and plankton. The OMG also has some specialised instruments for measuring the amount of turbulence in the water. That’s what the “microstructure” part of the name refers to – the sensors measure tiny changes in water currents associated with turbulence. We are really interested in turbulence, as it mixes nutrients, plankton and carbon through the water. The really neat thing about gliders is that when they surface they can stick their tail end out of the water and communicate back to shore via a satellite link, transmitting data back and also receiving new instructions. 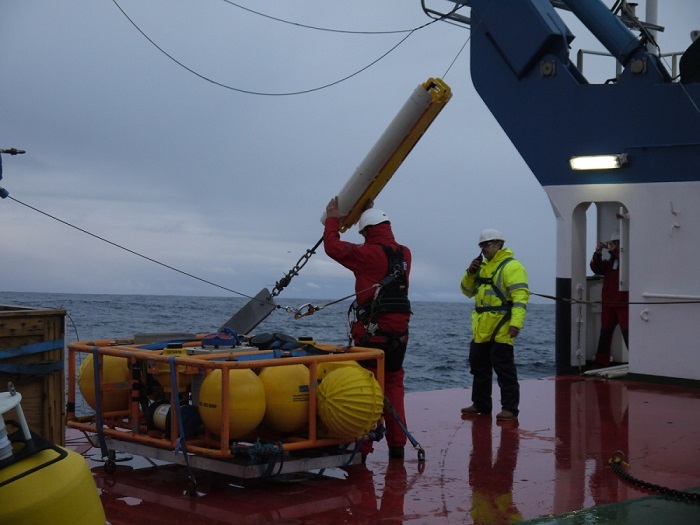 Our gliders are not controlled by us on the ship, but by scientists back at the National Oceanography Centre in Southampton and in Liverpool. Immediately the glider was away, we moved the ship clear and deployed a “wirewalker” mooring. This again has instruments for measuring temperature, salt and plankton, but it moves up and down a wire fixed to an anchor on the seabed and a buoy at the sea surface. The action of the waves on the buoy provides the energy that the wirewalker needs to ratchet itself down the wire (so, a note to my nephew Ben there – yes we do now have things that use the waves’ energy to power them! Your idea was spot on); it then releases its grip on the wire and floats back up to the surface. With decent waves (of which we’ve been having plenty) the wirewalker can profile up and down the cable every 15 minutes or so. Jo Hopkins for the National Oceanography Centre in Liverpool is running this instrument – she is keen to capture the details of how the water is mixing as the weather cools into winter. We’ve lost a lot of our communications at the moment – certainly internet and phones are out. Zoltan, the NMF computer tech, is working through all possible causes and he’ll be calling on the ships ELT tech as well. Hopefully we’ll be fixed soon. We still have access to the National Marine Facilities Webmail though, so I can get these posts through OK.